BOX OF CRYSTAL GEM NOSE RINGS CONTAINING 40 PIECES OF CRYSTAL NOSE RINGS IN 316L SURGICAL STEEL IN ASSORTED COLORS. A GREAT SELLER.FREE DISPLAY BOXES! HIGH POLISHED SEPTUM CLICKERS IN 14G OR 16G .THE DIMENSIONS OF THE SEPTUM CLICKERS ARE 14MM WIDE X 12MM HEIGHT ( 9/16" WIDE X 1/2" INCH HEIGHT).TOP QUALITY 316L SURGICAL STEEL.SEPTUM CLICKERS ARE A CONVINIENT WAY TO WEAR JEWELRY IN YOUR SEPTUM JUST SLIDE IN AND CLICK SHUT. 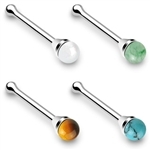 20 GAUGE 2.5MM PRONG SET C.Z GEM NOSE BONES IN A BIG MIX OF COLORS.COMES IN THE 8 POPULAR COLORS SHOWN BELOW.TOP QUALITY 316L SURGICAL STEEL.COMES WITH DISPLAY BOX WITH PROMOTIONAL STICKER.NOSE BONES HAVE A TINY DIMPLE ON THE END OF THE STEM FOR THAT PERFECT NOSE BONE FIT! 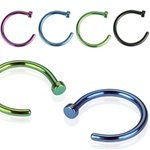 Titanium Anodized Over 316L Surgical Steel Nose Hoop Ring 20g 3/8" diameter. 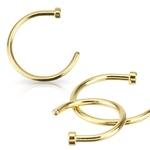 Flat backed open hoop design makes it very easy to wear!